As we approach the new year, it is natural in getting back into gear towards setting and achieving goals. Whether it’s to return back your formal exercise routine or striving for that desired weight goal, setting ‘SMART’ goals may be a good approach to ensure it is accomplished. SMART goal setting brings structure and trackability into your goals and objectives. Instead of vague resolutions, SMART goal setting creates verifiable paths towards a certain objective, with clear milestones and an estimation of the goal’s attainability. 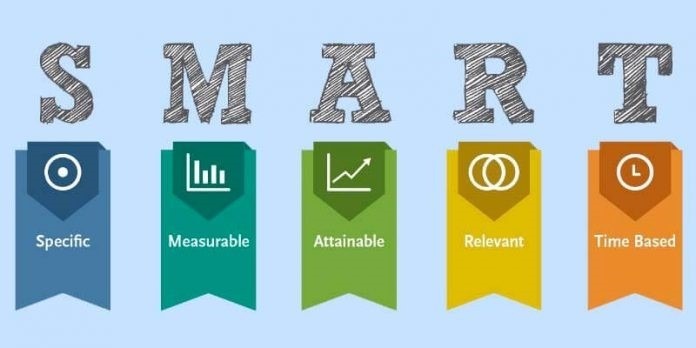 Every goal or objective, from intermediary step to overarching objective, can be made S.M.A.R.T. and as such, brought closer to accomplishment. Attainable: Means investigating whether the desire goal is appropriate to you. Ensure to weigh the efforts of time, cost and other obligations and priorities you have in your life. Relevant: Main questions to ask, why do you want to reach this goal? What is the objective behind this goal, and will this goal really achieve that? Timely: Keep your timeline realistic and flexible, that way you can keep the drive high. S.M.A.R.T. goal setting with Allied Health Professional Practitioners here at MD Health can support you in setting SMART goals and objectives, turning them into measurable goals and following up on their completion. That means training, helping, steering and cheering on the solution of your personal and professional challenges. Goal setting is generally done through our Initial Assessment (FBA), followed up by realignment during our Re-Assessments. It brings clarity to your plans and free up energy for achieving your goals. Feel free to speak anyone of us about discussing any new desired goals in regards to improving your health/fitness.